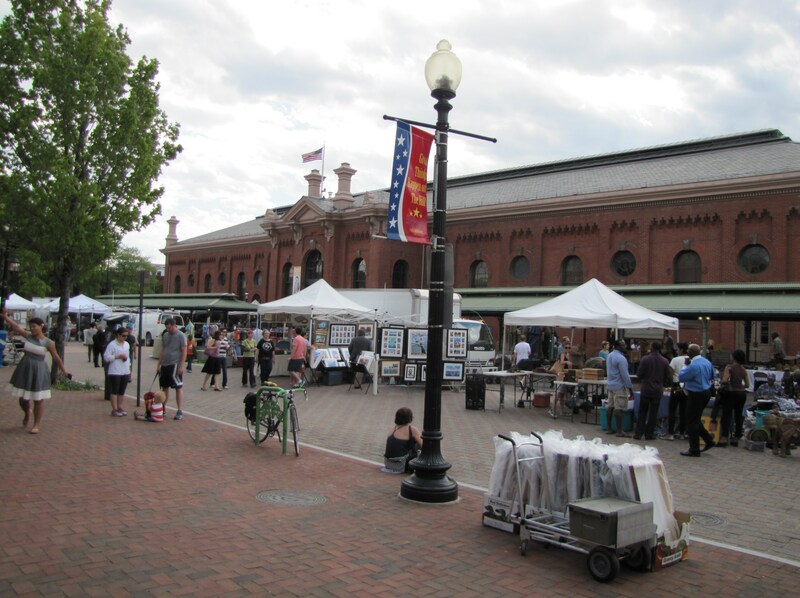 The changing character of Capitol Hill is perhaps nowhere more evident than at Eastern Market. 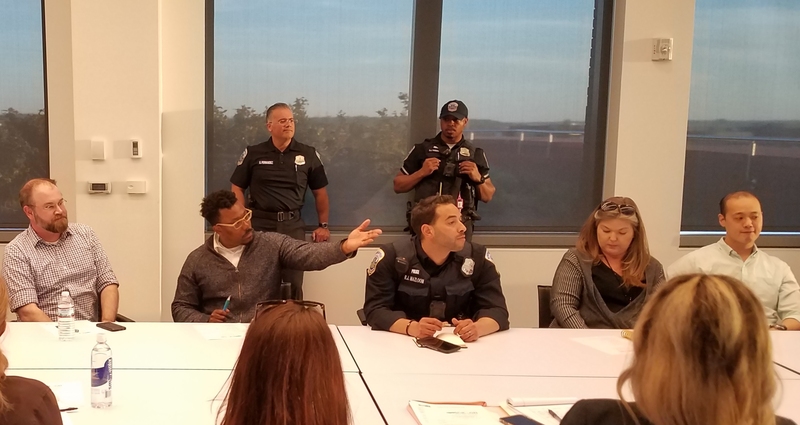 Last Tuesday, the Eastern Market Community Advisory Committee (EMCAC) heard a proposal by inside Market food merchants Bill and Tom Glasgow and Mike Bowers to re-open 7th Street outside the Market to traffic on Saturdays, allowing customer parking and improving access to their businesses. The proposal was the result of a meeting of inside merchants to provide input to a business plan being formulated by EMCAC to give future direction and cohesion to Eastern Market as it attempts to come to terms with changing demographics, new development, competition, and tourism. Bill Glasgow of Union Meats is the inside merchants’ representative to EMCAC; Tom Glasgow runs Market Lunch; and Mike Bowers runs the cheese and dairy shop. The​ir ​proposal to open 7th Street is a contentious​ one​ because it would eliminate the 34 vending positions for Eastern Market’s arts and crafts vendors who currently set up on 7th Street on weekends. The proposal is opposed by the 7th street vendors and their newly elected representative to EMCAC, Erika Rubel. Local artist and 7th Street vendor Joe Snyder says that “accessibility will continue to be a problem in an increasingly dense city and the Market will have to deal with it in a creative way” – but this should not include the reopening of 7th Street. Still, the proposal and its opponents reflect a tension between older, established businesses and newer up-starts. Few if any of other retailers have enjoyed more market-protection than Eastern Market merchants, who are grandfathered in and pay low to moderate rent; on the other hand, few have done more to establish the neighborhood as a commercial destination.​ Their counterparts on the outside of the market depend on foot-traffic and square footage, whereas inside the Hall merchants would prefer to see parking available to customers looking to take perishables and other goods home. 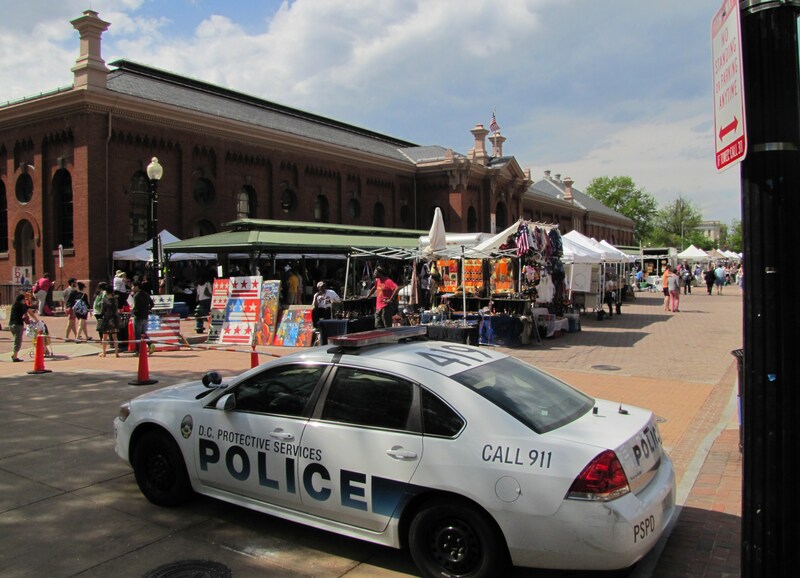 ​​Before the Eastern Market fire and the subsequent closing of 7th street by mayoral fiat under Adrian Fenty, the North Hall accommodated up to 40 arts and crafts vendors on weekends. With the reopening of the Market, vendors were moved to 7th Street and the North Hall became a gathering space accessible to the community, not only on the weekends, but during the week, especially by children’s caregivers and their charges. The Market has about 20 spaces for customer parking in the alley behind the market with a one hour time limit, but according to Glasgow, the parking is “not controlled at all,” adding, “We’ve been complaining for five years. It is absolutely essential to have parking. How can you have a food market without access?” Looking ahead to the proposed​ Hine development, he notes that although public parking will be provided, 7th Street between C and Pennsylvania Avenue will be closed on weekends to accommodate the flea markets. The proposed ​Hine development may present new ​and more acute ​challenges for the Marke​t​. 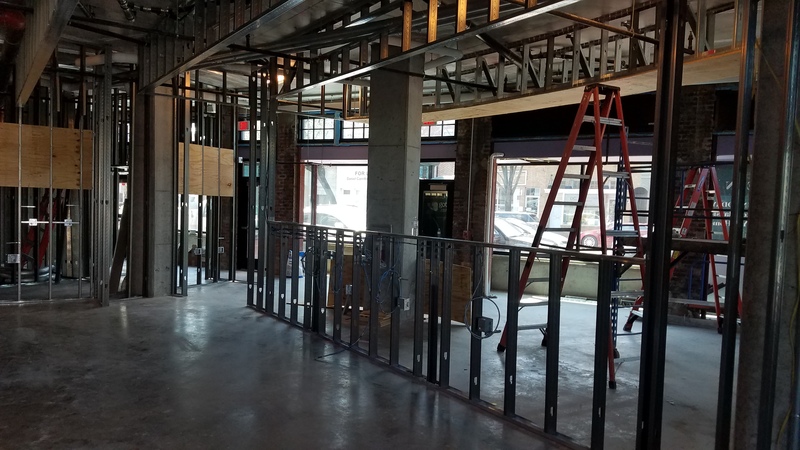 Stanton Development has mentioned Rodman’s – the family-owned chain of discount grocery/drug stores, with a selection of international foods, wine and beer – as a possible tenant for the new Hine development. Some market-​goers think that parking may not be the inside merchant’s entire problem. ​T​he more traditional Eastern Market may be suffering in comparison with the recently opened Union Market in Northeast. In addition, the increased quality of some of the products under the farmer’s line on Saturday heads off many potential customers before they get inside​, especially when inside goods do not excel in quality or offer competitive price points​. Likewise, the Market’s “Fresh Tuesdays” has brought locally produced higher quality produce and cheese to the farmer’s line outside the Market on Tuesday afternoons. ANC Commissioner Brian Pate is interested in seeing the farmer’s line opened one night a week for Community-Supported Agriculture (CSA) providers. CSA patrons pay upfront for shares of a local farmer’s harvest which are delivered to the customer. Pate would like to see the farmer’s line opened up for these deliveries – which would to some degree increase the pressure on the inside vegetable merchants. Since the demise of the Councilmember Tommy Well’s legislation providing for a new governing structure for Eastern Market, and with it, EMCAC’s proposal to consolidate under Eastern Market the control of the three separate outside vending operations (the Eastern Market vendors, Carol Wright’s Saturday and Michael Berman’s Sunday flea markets on the Hine parking lot) an element of mistrust has existed between Eastern Market’s outside vendors and EMCAC. 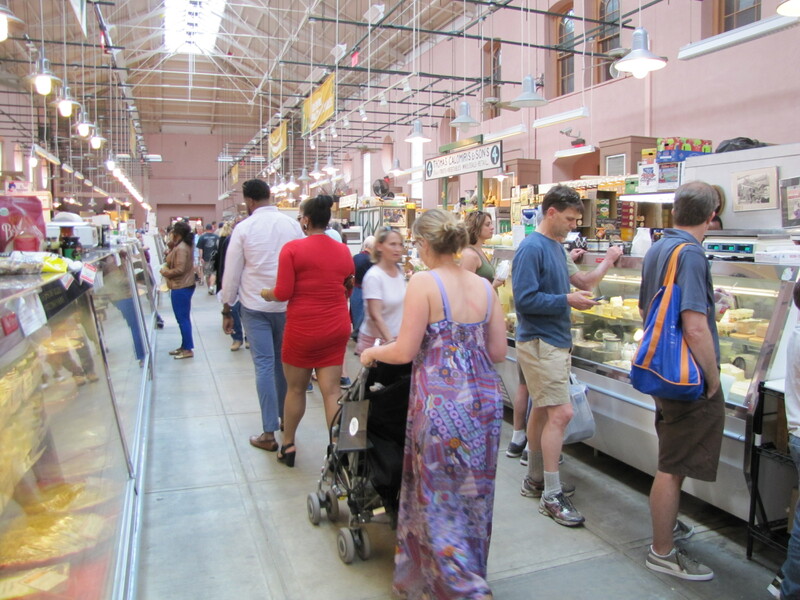 The Eastern market vendors see any consolidation as coming at their expense. Vendor Joe Snyder characterizes the proposed consolidation as an “impractical merger of the three markets,” and raises the concern of the potential displacement of longtime Eastern Market outside vendors. This is a critical time for the future of the Market. It would seem that a good first step toward a partial remedy would be to enforce limited time parking in the alley behind Eastern Market. EMCAC and ANC6B – in their advisory capacities – may not be the vehicles for problem solving. Given the lame duck status of Ward 6 Councilmember Wells and Mayor Gray, it is uncertain how much leadership they will or can provide – but in any event, the issues seem to require the attention of the executive branch rather than the city council. ANC6B suggests the way to increase housing and reduce traffic on Capitol Hill is to increase the cost of street parking for households with more than one vehicle. ANC6b bluntly told the Office of Planning (OP) that liberal parking policies by DDOT undercuts OP’s goals of providing more housing in the city and as well as the “desired effect” of reducing the number of cars on the street. The ANC suggests one remedy might be to increase the cost of a Residential Parking Permit for more than one vehicle per household. It seems likely that the cost would have to be significant in order to be effective. At its March 12 meeting, ANC6B endorsed the Office of Planning’s proposed change in the Zoning Regulations to eliminate the requirement that developers build a minimum number of off street parking spaces in new small residential developments and for all those close to public transit. 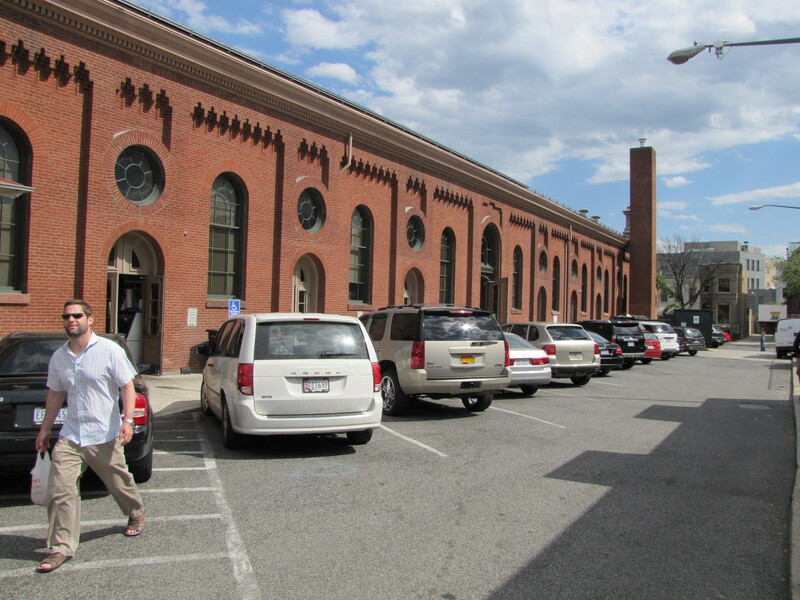 The language regarding the effect of DDOT policy and suggestion about increasing parking fees was attached to the letter to Harriet Tregoning, Director of the Office of Planning supporting doing away with the minimum parking space requirements. ANC6B urged OP to “use its authority under the city Comprehensive Plan to guide DDOT toward a revised Residential Parking Permit policy” including research on whether differential pricing of second or more permits would reduce demand. Other remedies are under consideration. A DDOT comprehensive parking study underway will consider capping parking permits per household and zone based parking – parking by neighborhood rather than wards. Whether any of these ideas is politically feasible is uncertain. At first glance, it would seem that the proposed parking changes gives a green light to developers. But the ANC’s veiled warning appears to be that by shifting the burden of parking from the developer to the neighbors in areas where parking is already tight, any proposed new development runs the risk of significant opposition from the neighbors resulting in delay, red tape, lawyers, hearings, etc. 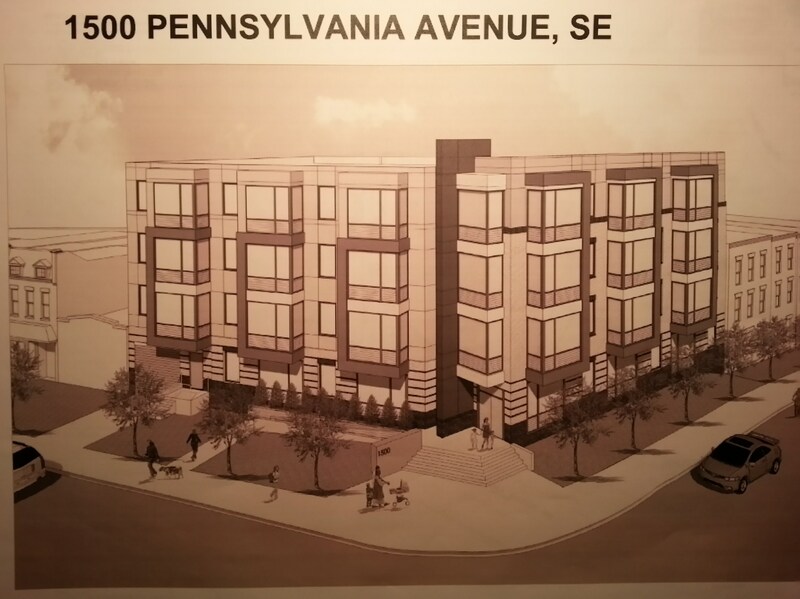 Such a case could be developing regarding the proposed 80-84 condo development at 1550 Pennsylvania Avenue, SE. The developer of the project, which is aimed at attracting young professionals rather than families, is seeking a variance from the parking requirement to provide a total of 31 parking spaces rather than the more than 40 required under current regulations. Neighbors have expressed concern about the effects of parking on the neighborhood, as well as the target demographics. The project is very close to the Potomac Metro stop. This case points up one possible effect of the elimination of the parking minimums. It seems likely that units built without parking will most likely appeal to singles and couples without children which changes the character of the neighborhood and the types of retail and commercial establishments it would attract. Again, removal of the minimum is no guarantee that developers won’t provide parking, depending on market pressure from potential buyers for guaranteed parking even at the increased cost per unit that would entail. The ANC Planning and Zoning Committee will consider the variance request at its April second 3 meeting at 7:00pm at St. Coletta of Greater Washington. The issue will come before the full ANC at its April 9th meeting. The matter foes before the Bureau of Zoning Administration on April 30, and they will have the final word. Only a few members of the community turned out for Zoning Committee meeting at St. Coletta’s, but that meeting and the following full ANC consideration of this issue represent the best opportunities for public input on the new zoning regulations. The first two are accomplished by the proposed change in the Zoning Regulations to eliminate the parking requirement. The city hopes this will discourage the use of cars and make it cheaper to build multi-unit dwellings. However, it seems highly likely that some of the new residents of these units will want cars and will park them on the street. Whether this proposed change will further the goal of providing more affordable housing – as asserted by Commissioners Oldenburg and Peisch last night – is questionable. There is no specific reason to believe that costs saved by eliminating parking will be allocated toward additional affordable housing. The parking changes should be argued on their merits alone. Such an effort to do so was made by Commissioner Ivan Frishberg, who cited the negative health effects on the community (especially children) of particulate emissions from autos, the increase in population attracted to the community by quality of life issues, and auto pollution’s contribution to climate change. He said flatly, that additional parking space (referring to the expensive to build on site parking) is not needed, that it is market driven, and “the market is not there for it.” The fact that Capitol Hill is already a high density residential neighborhood, and that it is routinely cited as a model for urban renewal in its current form, did not come up. For some reason, the Zoning Commission has decided to make proximity to the Metro and bus lines alone, rather than proximity to the Metro and existing low residential density, as the condition for which it will provide developers relief from parking regulations. Commissioner Dave Garrison opposed the proposed changes, saying that “we can’t’ afford more pressure and more people competing for parking space.” Committee Chair Francis Campbell agreed, pointing out the burden on the elderly and those who don’t have ready access to public transportation. According to ANC commissioners, the villain in Capitol Hill’s parking woes is the DC Department of Transportation (DDOT), whose current policy is to give a parking permit to any DC resident who wants one, though according to Commissioner Oldenburg, the Resident Parking Permit system is “under review.” Frishberg’s response was that parking is a problem and the solution is to “go after DDOT.” In other words, in the thinking of these commissioners, the ideal solution would be that new developments would be built, that parking would not be included in those developments, and that residents of those developments would not be able to obtain a parking permit. Once those residents become voters, it is hard to envision how such a policy could be sustained. Former ANC commissioner Ken Jarboe, who worked on the ANC’s Regulation Review Task Force, said he opposed the OP proposals because no alternative to taking away the parking had been presented. He pointed to the problems likely to ensue from the plan to put multiple small units in the Medlink building (7th and Constitution, NE) with no onsite parking. He said he was frustrated by people trying to use the Zoning Code to fix a problem that you can’t solve by using the Zoning Code, likening the effort to using a hatchet where a scalpel was needed. Voting for the change in regulations: ANC Chair Brian Flahaven (6b09), Vice Chair Ivan Frishberg (6B02), Nicole Opkins (6B06), Kirsten Oldenburg (6B04), Brian Pate(6B05), Phil Peisch (6B03). Also voting for the change were Resident Members of the Planning and Zoning Committee Christian Alexander (6B08), Jennifer Rosen (6BB03), and Tom Woteki (6B05). Voting against: Committee Chair Francis Campbell (6B10), Chander Jayaraman (6B08), and Dave Garrison (6B01). Commissioner Sara Loveland(6B07) was not present. The Committee subsequently agreed to endorse the OP’s plan to make the opening of small commercial outlets in existing townhouses – provided they meet certain criteria. In an effort to give residents immediately adjacent to such retail a voice, the Committee voted to require that such use be only through the special exception process. Among the uses which would be allowed for such conversions are the following: artist venue, antique shop, drugstore, department store, grocery store, clothing or gift boutique, appliance repair, shoe repair, tailor, hair salon, deli, coffee shop, and ice cream parlor. The number of such establishments per block and the hours of operation and number of employees would be limited. The full ANC6B will consider the Planning and Zoning Committee’s recommendations next Tuesday, April 12, at 7:00pm in Hill Center. Since six of the ten commissioners have already voted for the zoning regulation changes, the result of the Commission’s consideration next week is unlikely to be different. Tuesday night, ANC6B’s Planning and Zoning Committee will consider proposed citywide revisions to current Zoning Regulations. ANC6B formed a special Zoning Regulation Revision Task Force headed up by Commissioner Dave Garrison to consider these changes. 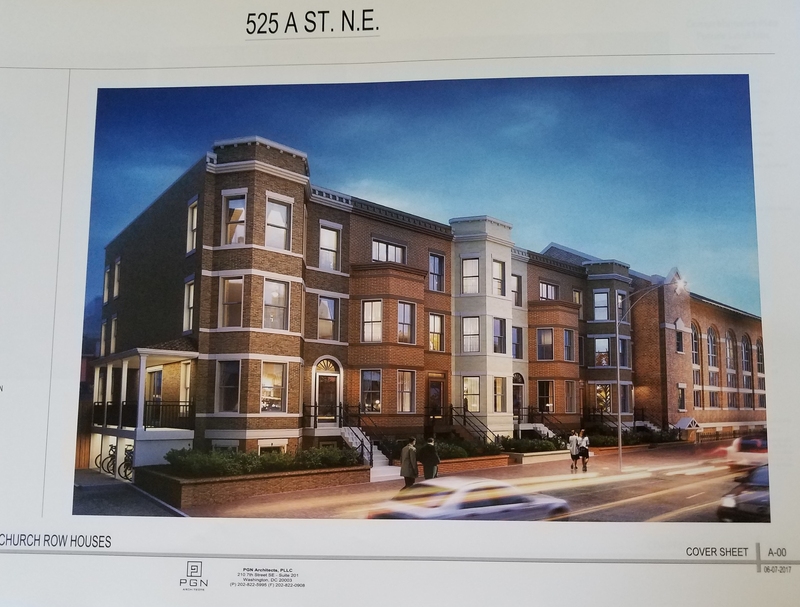 At its meeting last Thursday night, the Task Force agreed simply to refer the most contentious items to ANC 6B’s Planning and Zoning Committee, chaired by Francis Campbell, which will deliberate these issues before the full ANC takes them up on March 12. Less discussed, but no less important, is the fact that proposed changes would benefit developers because the change in regulations would shift the burden of new parking from them to the residents. By changing the rules about who can park on the street and by reducing the number of spaces available, you reduce traffic, but you also create a more competitive parking environment. An official embrace of “new urbanism” also makes it cheaper to build developments by freeing developers of the obligation to build parking into their plans. While few would disagree with the goal of reducing traffic, the question of who should bear the burden of that reduction is not being discussed in explicit terms or with full candor. Nor are the long term consequences for the city and the nature of urban living being considered. Many on Capitol Hill, especially older residents, find that owning a car is necessary in order to live here. Among the most important revisions being considered by the Planning and Zoning Committee next Tuesday are proposed regulations that would eliminate the requirement for developers to include on-site parking for new town houses or apartments or condos with up to ten dwelling units. Off-street parking would not be required for residences in the historic district. In addition, there would be no on-site parking required for apartments or condos of any size, as long as they are built within a half mile of Metro or a quarter mile of a high service bus line. Two other proposed regulations would promote increase population density in ANC6B with the likely result of increasing the street parking demands. The first would make it easier to turn carriage houses into dwelling units if they are associated with a single dwelling unit townhouse; owners of a townhouse with an English basement could not convert a garage or carriage house unless the basement unit was eliminated. The second would permit building on alley lots. Although ANC6B only has a dozen or so vacant alley lots of the minimum 450 square feet, the number of alley lots with existing buildings such as garages or other buildings which could be converted is unknown. Another proposed change would allow for commercial use of any building in residential areas, including corner stores under certain conditions. This could have a potential impact on parking and traffic, though no projections have been offered. While these regulatory revisions have received a sustained discussion within certain DC circles, they have by and large been under the radar and escaped the attention of the residents most affected by them. Task Force Chair Garrison noted that there will be two opportunities for ANC input: first, when the recommendations of the ANC go to the Office of Planning, second, when the Office of Planning submits the final proposal to the Planning Commission later in the spring. In sum, these regulatory revisions amount to a city planning effort that represents a departure from current code. There have been community meetings designed to garner resident input but some attendees have left the meetings unsatisfied that their concerns and issues were being heard. The Planning and Zoning Committee will meet Tuesday night at 7:00pm at St. Coletta of Greater Washington, 1901 Independence Avenue SE.